The Uffizi palace was commissioned by the Grand Duke Cosimo I to Giorgio Vasari, in 1560. What was there between the Palazzo Vecchio and the Arno river before the Uffizi palace was built? Beyond the church of San Pier Scheraggio – incorporated in the palace – there was the ancient port district, probably built in the Roman Age. We have to remember that at that time the Arno was navigable. The area was characterized by popular houses and lots of taverns and brothels. One of these taverns gave its name to the district: Baldracca, that in Italian is a vulgar word for ‘prostitute’, still in use today. The word originated from a malapropism of Baghdad, which – at that time – was mistaken with the Babel of the Bible, probably because of the mix of languages spoken in the district. The area is mentioned also in the Decameron by Boccaccio, in the novella of Frate Cipolla, the friar who pretends to have travelled all over the world, only by mentioning the names of some Florentine streets. So it was easy for the Grand Duke to decide to eliminate that district and to build a big palace, in which to gather up all the Florentine magistrates: the Uffizi (offices). The ruins of the ancients buildings have come up recently, during the construction work of the New Uffizi. You can always see the remains of the church of San Pier Scheraggio on the external wall of the Uffizi, in Via della Ninna, while the central nave is part of the exhibition area of the museum. After Vasari and Cosimo I died, the Grand Duke Francesco I and the architect Bernardo Buontalenti finished the work. Thanks to them, in 1581 the Uffizi Gallery was born at the second floor of the palace. The Tribuna was the centre of the exhibition: the most precious artworks were displayed in this octagonal room. The Medici family kept on collecting artworks of great importance. In 1789 Pietro Leopoldo I of Habsburg-Lorraine opened the Gallery to the public. The collection of the Uffizi also grew during the 20th century, and nowadays it is one of the most important and visited museums in the world. 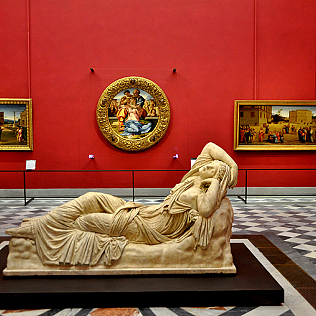 However, the evolution of the Uffizi Gallery is still in progress. The objective is to renovate the exposition criteria and the rooms and to create new itineraries for visitors.